Italian food has been one of my favourites since I was a teenager so you can only try to imagine how happy I am when I visit Italy and enjoy the local Italian meals. Italian cooking is among the world’s richest and most varied, with dishes perfect for every occasion. Italian cuisine is regional with the variations being much more local, also the cuisine is seasonal making sure that you are able to eat the freshest and most delicious fruits and vegetables. Eating a leisurely Italian meal is one of the pleasures of travelling in Italy! Italians take food very seriously. Food in Italy, varies by region so be sure to explore the regional specialties where ever you go. Each region, and sometimes even a city, will have regional specialties that they are very proud of. There are many types of places to dine in Italy. If you just want a sandwich, you can go to a bar. A bar in Italy is not just a place for drinking alcohol and there are no age restrictions. People go to the bar for their morning coffee and pastry, to grab a sandwich, and even to buy ice cream. Some bars also serve a few pasta or salad selections so if you just want one course, that’s a good choice. A tavola calda – serves already prepared food fairly fast. Pizzeria – although known for baking and selling pizza, they often offer pastas, salads, main meals and desserts. It is very rare that I eat a pizza in Australia, however I enjoy them several times a week when I am in Italy. Osteria – this was once a very casual eating place but now there are some more formal ones. Trattoria – also a more casual eating place but can often be the same as a restaurant. The traditional Italian menus have five sections. A full meal usually consists of an appetizer, first course and a second course with a side dish. It’s not necessary to order from every course, but usually people order at least two courses. Italian Appetizers – Antipasti: Antipasti come before the main meal. 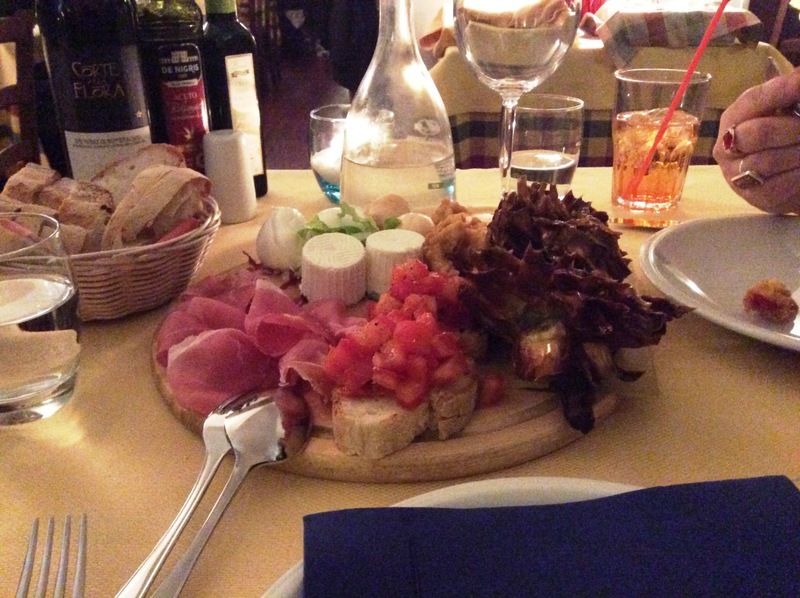 One choice will usually be a plate of the local cold cuts and there will probably be some regional specialties. The First Course – Primo: The first course is pasta, soup, or risotto (rice dishes, especially found in the north). Usually there are several pasta choices. The Second or Main Course – Secondo: The second course is usually meat, poultry, or fish. It doesn’t usually include any potato or vegetable. There are sometimes one or two vegetarian offerings, although if they are not on the menu you can usually ask for a vegetarian dish. The Side Dishes – Contorni: Usually you will want to order a side dish with your main course. This could be a vegetable (verdura), potato, or insalata (salad). I sometimes order only a salad instead of the meat course. The Dessert – Dolce: At the end of your meal, you will be offered dolce. Sometimes there may be a choice of fruit or cheese also. After dessert, you will be offered caffe or a digestivo (after dinner drink). Italian food is as varied as the land and the people, and this means that there are a great many delights to be discovered. Aren’t we lucky that Italians brought their lovely food here for us to enjoy? That food looks so good!!!!! Nothing like a fantastic pizza with seasonal vegetables and mozzarella di buffala! Lyn Menu, venue,ambience all lead to the gastronomic delights of Italy. Buon appetito!!!!! I could read about, write about and EAT Italian food every day! Great post! Thanks to you Lyn and this post I am hungry again :D even after lunch! Just shared your post with a friend, hope you get lot of traffic from India ..Ciao! How cool! I love them too much. maybe il get sick of them too like you if I have too many ;) I would love to visit Le marche. esp Urbino, Grottomare and Offida.